The cinnamon challenge...eating Tide pods...the internet has delivered a number of unhealthy viral trends that fill kid's social streams with bad ideas. Recently, a new trend is gaining in popularity—one that combines the empowering appeal of a "life hack" with frequently unsafe home healthcare practices. DIY Dentistry. This trend is causing an increasing number of illnesses and injuries from botched procedures, and the number of sources of misinformation is only increasing. DIY Dentistry comes in the form of readily available videos and kits which offer tips, tricks, and other home-grown approaches to managing dental issues which should be handled by trained professionals. This trend isn't being driven just by teens-being-teens and trying anything they see online, but also by those who have had to find alternatives to standard dental treatment due to their location or financial limitations. 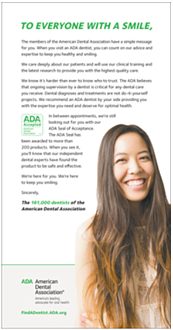 This issue has become a big enough problem that the 160,000+ dentists of the American Dental Association, the American Academy of Pediatric Dentists, the American Association of Orthodontists and others were forced to begin advertising campaigns in late 2018 to warn parents and kids. “Public health and safety is our number one concern, and that’s why we are taking steps to educate the public about DIY dentistry,” said Dr. Joseph P. Crowley, ADA president. “Dentists play a role, too, and should talk with their patients about DIY treatments.” Nigel Carter OBE, Chief Executive of the British Dental Health Foundation, warns: "DIY dentistry is both dangerous and unnecessary. It is all too easy to make the problem worse, which could result in more invasive and expensive treatment, so I urge those considering self-treatment to think again." This issue goes much farther than clinicians being cautious. Even news outlets like Vice News, the New York Times, and countless local CBS/NBC/ABC news affiliates have spoken out and reported on the dangers inherent with this trend. A quick Google Video search for the Dangers of DIY Dentistry will quickly give you an idea of how big an issue this is becoming. Some of these processes can cause serious injury which require costly surgeries and procedures to then correct, so it pays to know what to look for. DIY cavity filling - These videos encourage everything from using wax or household materials to mixing your own dental packing and adhesive materials. Even with the safer temporary wax which you've always been able to buy at the pharmacy, without a dentist, you only know where the pain is, you can't tell the specific cause or location. Using a DIY method risks more deeply burying the underlying cause of the pain and extending the amount of professional care needed to correct the issue. Self-whitening - This is an area where there are some safe home-options, but also a number of misleading sources for DIY approaches. Even clinically tested and proven whitening products from major manufacturers like Colgate include language that strongly urges you to include regular visits to your dentist and discussion of use of their products as a part of a healthy oral plan. One-size fits all/clip-on veneers - It's no secret that cosmetic dental procedures have a reputation for high cost. This being the case, it's no surprise that related kits a videos represent a large portion of this DIY landscape. The problem with this widespread approach to veneers is that one size does not fit all, and the result of a bad fit could include damage to your gums and jaw—in addition to masking a problem whose root should be addressed clinically. DIY braces and aligners - Perhaps the most dangerous example in this trend are DIY braces and home-based tooth-alignment hacks. These hacks involve the application of everything from rubber-bands to more polished commercial alternatives like SmileDirect™, and because they involve the restriction of growing muscles and teeth, have the greatest risk for serious complications. A great resource for anyone considering a DIY approach of this type is the 14 questions you need to ask before going with something like SmileDirect quiz from the American Association of Orthodontists to help you really understand what's at risk. Tooth Extraction - When tooth pain is so severe you just can't take it anymore, some DIY resources suggest pulling your own tooth. Yes, they suggest some antibacterial steps to reduce the risk of infection, but tooth extraction is really a form of surgery, and any surgery comes with the risk of complications. Without the guidance and skill of a trained professional, that single home-extraction can cost you thousands of dollars and hours of pain addressing it in the dental chair afterward. By now you are hopefully taking a more scrutinous look at any DIY approaches which you or your kids are considering. While some of these hacks only risk the loss of one's time and energy, others have serious implications. For many of these DIY procedures, tooth loss, abnormal bite, and infection are a serious concern. Dentists use sterile instruments and carefully controlled environments that your kitchen sink just can’t duplicate. No matter how much you may want to avoid the dental chair, there is simply no substitute for the regular care of a trained clinician. Looking for more evidence? Read this case study on how DIY orthodontics can go very wrong. If you are considering DIY oral care beyond regular brushing and flossing, do yourself a favor and have a simple conversation with your dentist. You may be able to find a solution which encourages the changes you want to see, but in ways that are safe for your jaw, mouth, and gums. Remember, no amount of money saved through DIY dentistry is going to able to offset the pain and costs of eventually having to correct these no worsened conditions in the dental chair. Know who to trust. Schedule regular visits to your pediatric dentist to avoid the need or temptation or DIY approaches. Plus, relying on trustworthy professionals means you can rest easy knowing they’re not just correction the problems you have today, but are also on the lookout to prevent new issues from beginning.